The congenital dermal sinus (CDS) is a type of closed spinal dysraphism in which an epithelium-lined sinus tract from the dorsal skin surface extends inwards for a variable distance. It occurs during neurulation when the neural groove closes to form the neural tube on day 26 of gestation and results from a failure of neuroectoderm to separate from the cutaneous ectoderm. Thoracic and cervical regions where the neural folds fuse first are the rare sites for dorsal dermal sinus, whereas lumbosacral and occipital dermal sinuses are relatively frequent. Dermoid and epidermoid tumors and posterior arch defects of the vertebral column can be seen in association of dorsal dermal sinuses. The presence of dorsal dermal sinus in the upper thoracic region in association with spinal intramedullary dermoid cyst is rare. A 2-year-old male child presented with a 3 month history of progressive lower limb weakness and urinary retention. He had a skin dimple, which was identified at birth. Subsequent observations of intermittent sebaceous discharge were not followed by medical examinations. There was no history of meningitis. On physical examination, the patient's skin over the upper thoracic region showed a midline dimple with hair [Figure 1]. Neurological examination revealed paraparesis (3/5), exaggerated knee and ankle reflex, and sensory level at T6. Plain X-ray of the thoracic spine was interpreted as normal. Magnetic resonance imaging (MRI) revealed a well-circumscribed intramedullary cystic mass extending from lower border of T4 to upper border of T7 and a sinus tract connecting it to the skin dimple [Figure 2]. 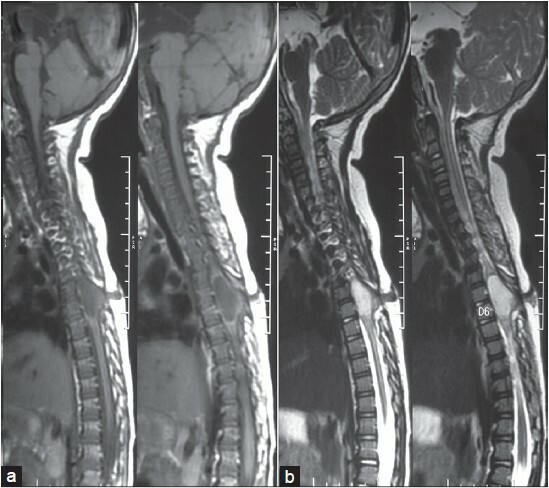 Spina bifida of T6 was evident on axial images [Figure 3]a. The tumor was hypointense on T1-weighted images and hyperintense on T2-weighted images with enhancement appreciated on gadolinium administration [Figure 3]b. On operation, in prone position, vertical midline skin incision encircling the skin dimple was made, and the sinus tract was followed to the spinous process of T6 with the dissection of the dermal sinus stalk. T6 spinous process was found to be splayed at the midline through which, the sinus tract traversed the lamina of T6 and then pierced the duramater. T5-7 laminectomy was performed, and the dura was opened. A well-encapsulated, cystic, intramedullary tumor containing wax-like sebaceous materials and tuft of hair was encountered in communication with the sinus tract. The surgical microscope made it possible to find a plane between the tumor and the spinal cord, and total excision was performed. The dura was closed in a water-tight fashion. 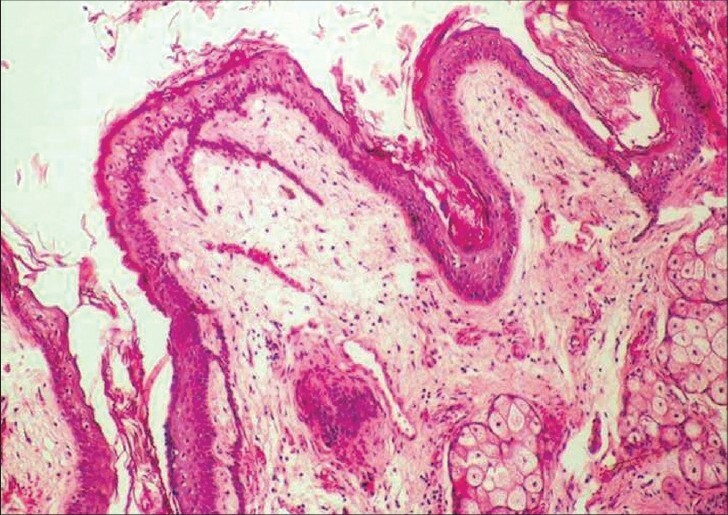 Microscopic examination revealed a typical dermoid cyst lined by well-differentiated keratinizing squamous epithelium [Figure 4]. The postoperative course was uneventful, with notable improvement in neurological function. The patient gradually regained normal strength in his leg in 6 months time. Dermoids are rare, benign, slow-growing lesions constituting 1.1% of intraspinal tumors. The majority are in the extramedullary or subdural juxtamedullary in the lumbosacral region, usually in the conus or cauda equina. Intraspinal intramedullary dermoid cyst is uncommon. The complex of upper thoracic CDS beginning from the skin, passing through the tissue layers, communicating with the intradural intramedullary dermoid cyst and spina bifida observed in this patient is rare. Out of five cases of spinal CDS described by Wang et al.,  one had dermoid cyst at T6-T7 level in association with CDS. This condition may be missed as a result of an asymptomatic clinical presentation. Physical examination and MR imaging are helpful in the diagnosis. The hallmark of CDS is a midline cutaneous dimple overlying the spine. Other cutaneous abnormalities, such as hemangiomas or hairy patches may be associated. The orifice of the sinus may be so small that it escapes detection except on close inspection. Hair may be seen protruding from the opening. The sinus tract begins at the skin dimple and tracks cephalad through the soft tissues to traverse the dorsal dura, as demonstrated in this case. Congenital thoracic spinal dermal sinus presents clinically with recurrent meningitis and neural compression. It becomes symptomatic as a result of either infection or associated mass lesions, which can be epidermoid, dermoid, or teratoma. A progressively enlarging inclusion tumor along the sinus tract in the spinal canal will eventually result in compression of adjacent neural structures. Many inclusion tumors associated with CDS are asymptomatic because of a slow growth rate, resulting in late presentation. The majority of dermal sinuses clinically manifest within the 1 st decade, usually before the age of 5, because of their tendency to become infected. Aseptic meningitis may be observed because of pressure or rupture of a coexisting dermoid cyst and/or epidermoid tumors. , In some patients, debris or purulent material may drain from the sinus tract, as in this patient. Although it may be localized and superficial in form, it may also precede the onset of meningitis or intradural abscess. Skin stigmata and recurrent meningitis of unknown origin are important clues. Therefore, the midline skin should be inspected carefully when a child suffers repeated episodes of unexplained meningitis. , Morimoto et al.,  reported CDS in association with intramedullary abscess and dermoid at T12-S1 level in a 1-month-old child who presented with a dimple over the lumbosacral junction discharging pus. Diagnosis in cases of dermal sinus is made based on physical and neuroimaging examinations. Physical manifestations include typical skin lesions such as lipoma, hemangioma, hair follicles, dermal sinus mount, dimple, and meningocele. Neuroimaging examinations include direct X-ray films, computerized tomography, and MRI. The sinus tract is best demonstrated by MRI. ,, MRI provides rapid and accurate identification of the extent of these lesions, shows the extraspinal portion of the sinus tract and associated inclusion tumor, and defines the degree of the spinal cord compression. The MR characteristics of dermoid cyst are hypointense on T1-weighted imaging, hyperintense on T2-weighted imaging, and peripheral enhancement with gadolinium administration. CDS associated with an intramedullary dermoid cyst in the thoracic spinal level is rare. Such dermal sinuses should be evaluated without delay, in view of the risk of infection and associated morbidity with an expanding inclusion tumor. Early diagnosis and prompt surgical intervention offer the best chance of functional neurological recovery and prevent serious morbidity. 1. Wang KC, Yang HJ, Oh CW, Kim HJ, Cho BK. Spinal congenital dermal sinus- experience of 5 cases over a period of 10 years. J Korean Med Sci 1993;8:341-7. 2. Amador LV, Hankinson J, Bigler JA. Congenital sinal dermal sinuses. J Pediatr 1955;47:300-10. 3. Martinez-Lage JF, Esteban JA, Poza M, Casas C. Congenital dermal sinus associated with an abscessed intramedullary epidermoid cyst in a child: Case report and review of the literature. Childs Nerv Syst 1995;11:301-5. 4. Aydin K, Sencer S, Minareci O. Thoracocervical dorsal dermal sinus associated with multiple vertebral body anomalies. Neuroradiology 2001;43:1084-6. 5. In: Greenberg MS, editor: Handbook of Neurosurgery. 3 rd ed., Cornell: Greenberg Graphics Inc.; New York: Thieme; 1994. p. 170-3. 7. Morandi X, Mercier P, Fournier HD, Brassier G. Dermal sinus and intramedullary spinal cord abscess. Report of two cases and review of the literature. Childs Nerv Syst 1999;15:202-8. 8. Lunardi P, Missori P, Gagliardi FM, Fortuna A. Long-term results of the surgical treatment of spinal dermoid and epidermoid tumors. Neurosurgery 1989;25:860-4. 9. Arseni C, Danaila L, Constantinescu N, Carp N. Spinal dermoid tumours. Neurochirurgia 1977;20:108-16. 10. Hattori H, Higuchi Y, Tashiro Y. Dorsal dermal sinus and dermoid cyst in occult spinal dysraphism. J Pediatr 1999;134:793. 11. Shen WC, Chiou TL, Lin TY. Dermal sinus with dermoid cyst in the upper cervical spine: Case note. Neuroradiology 2000;42:51-3. 12. Morimoto K, Takemoto O, Nakamura H, Takeuchi M. Spinal Dermal Sinus associated with intramedullary abscess and dermoid. Pediatr Neurosurg 2003;39:225-6. 13. Alafaci C, Salpietro FM, Grasso G, Collufio D, Caruso G, Morabito A, et al. Lumbosacral congenital dermal sinus presenting in a 52-year-old man. Case report. J Neurosurg Sci 2000;44:238-42.